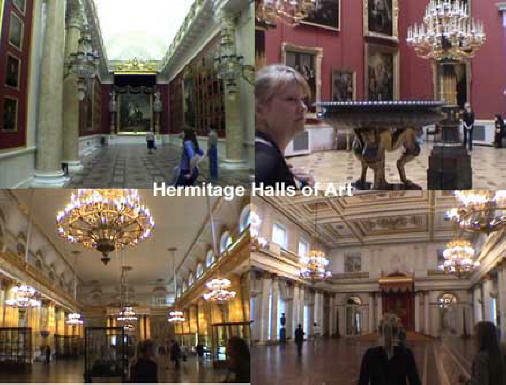 We started through the Hermitage at 5:00 PM and our guide, Rialemma, rapidly raced us up and down and all over the place to see the most famous works of art and within an hour the museum was closed and we were out of there. She really knew her stuff. 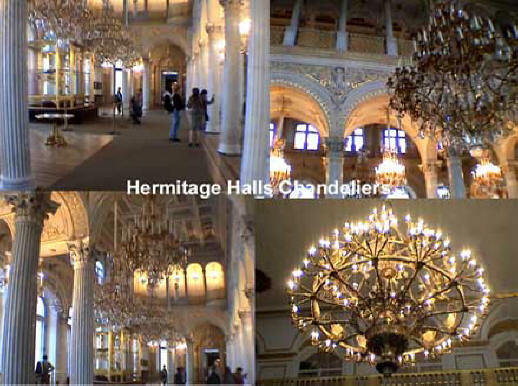 This place was huge with multiple floors. 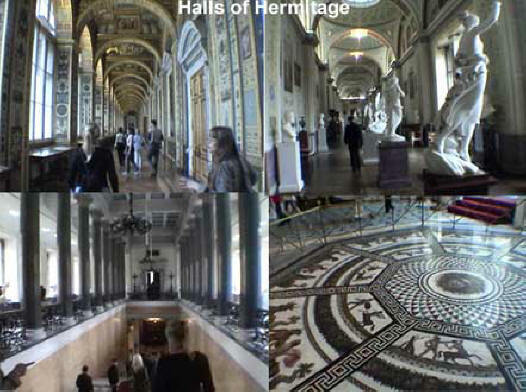 Below are a series of collages I made from the video tape I took as we raced around. 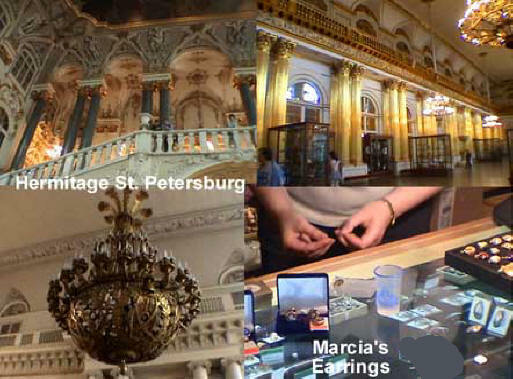 We looked at the museum shop offerings and Marcia bought some earrings (above) and at 6:00 Polina had driven us to her favorite souvenir shop. 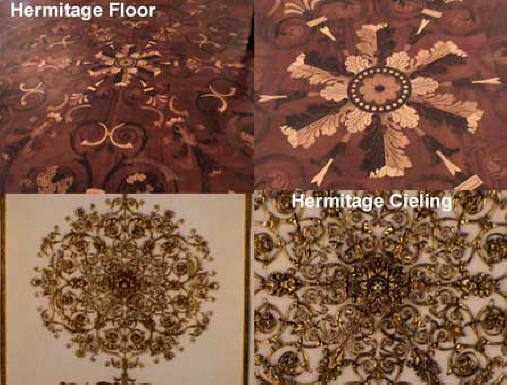 It had just about everything you could imagine at reasonable prices. I bought the set of the familiar Russian nesting (or stacking) dolls which they call matryoshkas or in English “matrushkas.” The set I got were of US Presidents from Carter to Bush 43 which I thought was unusual. Maybe I should have bought the Russian leaders from Kruschev to Putin. After we left the shop at 7:00, we got stuck in traffic again but by 7:30 we were able to see the exterior of the Church of Peter and Paul where all the old Tsars are buried. 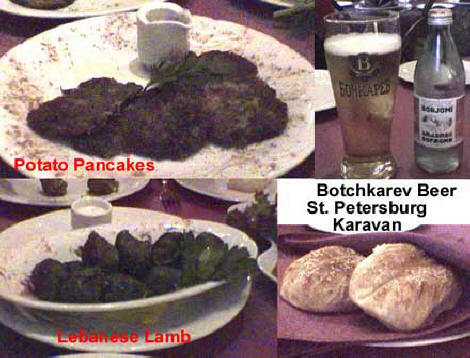 She then took us to dinner at 8:00 at the Karavan [Voznesenskiy Prospkt 46, +7-310-5678 or -311-2800.] After helping us order, she took off while we had dinner. She has a young daughter at home to take care of. 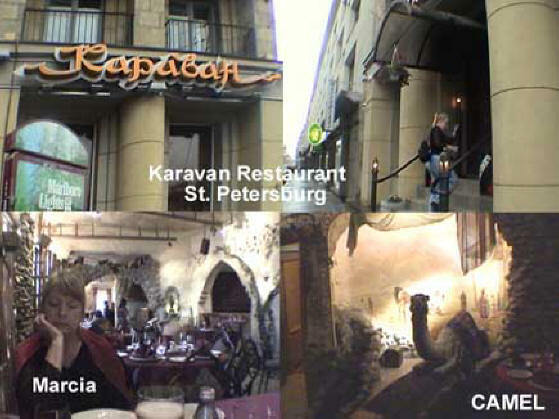 The motif of the restaurant was a desert caravan with designs of oases and statues of camels. Quite unexpected. 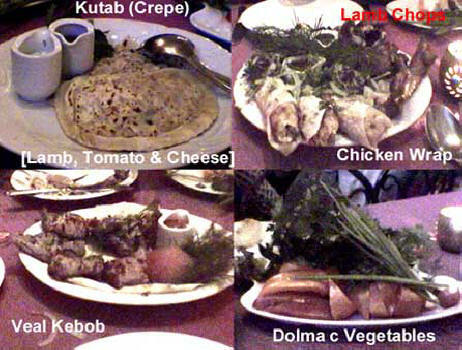 This was followed by a kebob of lamb chops (below right, upper left,) chicken wrap (above right, upper right,) and finally veal kebob (above right, lower left.) This was certainly a lot of food! For desert Marcia had hot chocolate cake (below right, upper right) and I had ice cream with fruit (below right, lower left.) All this was recommended and selected by Polina before she left. 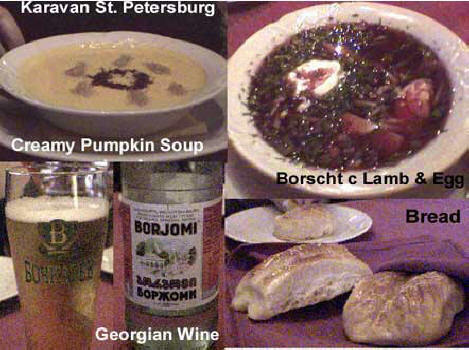 The dinner was really excellent and it was absolutely the best borscht I had ever eaten. I will definitely want borscht again. 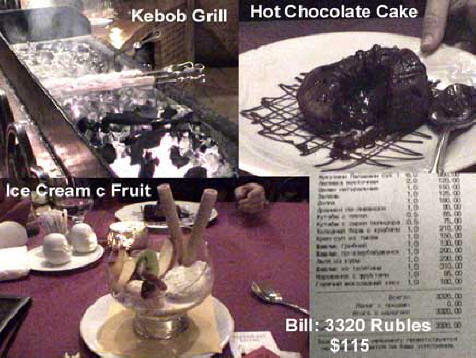 The entire dinner and drinks came to 3320 rubles which is about $115 for the two of us. A bargain! Polina showed up right on time at 10:30 and drove us back to the hotel. I was surprised she hadn’t joined us for dinner but she explained that she wanted us to have some time alone and she also wanted to have dinner with her daughter. She is a single mom and her mother watches her while she is working. After she dropped us off at 11:00, I had a cappuccino at the Borsalina Bar at the hotel, worked on Palm expenses and video photos and got to bed at 1:45 AM. The apprehension we felt originally about not being under Western European laws was gradually beginning to wane. We still had to be careful, as Dimitrii had carefully warned us. All and all, an exciting day for our first day in "Mother Russia."